Dimensions 0.75 by 9 by 11.75 in. 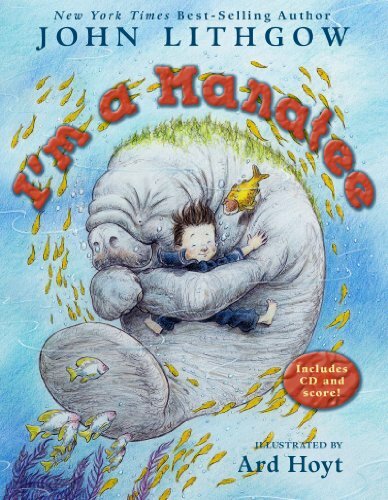 A delightful picture book, filled with lively text and rollicking rhymes, follows a young boy who falls asleep and pretends he is a manatee, embarking on a grand ocean adventure where he meets other underwater creatures, saves a boater from falling overboard, and returns home. 100,000 first printing. A little boy dreams of becoming a manatee, and what a dream it is! With his new gigan-atee manatee proportions, he sets off on an underwater adventure with his manatee friends. Join John Lithgow and Ard Hoyt on this silly aquatic escapade, then sing along with John, who performs "I'm a Manatee" on the enclosed CD. About: A boy imagines that he is a manatee, sprinkling seaweed on his Raisin Bran-atee and dignifying his watery domain with his wit, sophistication, and urbanity.